Reliable, efficient lighting has become an integral part of today’s kitchens, baths and closets. A must have at the top of homeowner’s lists regardless of whether it’s a remodel or new build. Häfele America Co., a leader in LED lighting technology, and its Loox LED Lighting system is here to make all of your design visions become reality. Whether it’s a kitchen that’s basked in accent or task illumination from the moment you walk in, cabinet lights which turn on or dim with the wave of a hand, or finally being able to actually see the contents of your drawers, Loox seamlessly integrates into any project. Ideal under cabinet task lighting, upper cabinet illumination, in-furniture applications and accent lighting, the newest generation of flexible LED light strips and flexible silicone strips made by Häfele area available in a variety of warm and cool color temperatures to suit your mood or need. Inherently modular by design, these are a go-to choice for designers and installers because of the continuous quality of light output, “plug and play” installation and years of efficient, trouble-free performance. Whether it’s illuminating cubbies for trophy display cases or stylishly lighting a bath, kitchen or closet, puck lights are an excellent choice. 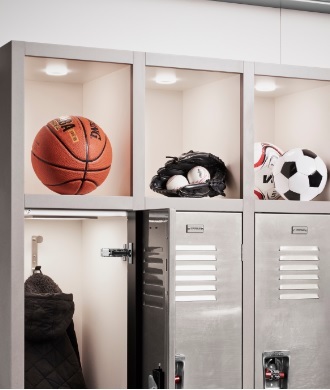 Small, yet powerful, Häfele’s newest puck offerings give you the option to recess- or surface-mount round or square fixtures essentially wherever you may need light. IP44 rated pucks are ideally-suited for wet areas like above a kitchen or bathroom sink. Available finish options include nickel matt, aluminum matt, black and white trim colors. At just 6 mm thick, Loox also now offers flat, larger round and square LED fixtures in flush- and recess-mounted varieties for even, diffused light in kitchens, closets, vestibules or other light-deprived areas. Flipping a switch is passé. Lights turning on as you enter the room or closet is positively glorious. In addition to the common push button, rocker and door contact switches are now items such as touch free and door sensor switches. Taking switches to an entirely different level would be in-line, extrusion mounted dimming switches, the previously noted motion detector switches—which are also only triggered when they also sense body heat—as well as touch free dimmers and capacitive switches. Capacitive switches are incredibly slick as they can actually be concealed in casework and then activated by either waving your hand over them or holding your hand in place to dim the lights up or down. Dimples are cute—but never when they take the form of light diodes bouncing back from your granite countertops or other surfaces. Placing Loox LED flexible strips and flexible silicone in an extrusion with a milk lens allows for an even, diffused glow across the entire channel. An expanded range of light channel mounting angles allows you to better control placement and beam angles including 90° for direct, perpendicular lighting coverage and 40° angle extrusions which are great for lighting rear counter areas. Rounded, low-profile extrusions are also available for in-drawer lighting use. An incredible add-on to Häfele’s Loox lighting is the Sound System 105 Bluetooth speaker. This invisible sound system was developed to be installed into furniture and cabinet pieces. A Bluetooth receiver with an integrated exciter (sound transducer), is neatly encased in a specially designed, compact body. This sends vibrations through different surfaces, transforming every piece of furniture into a sound conductor (speaker). The device is designed and built to be powered by a single plug and play Loox 12 V driver. This can be a complement to an existing Loox lighting system or installed independently.